My sister and her husband went away overnight to celebrate his birthday on Friday, so that meant I got to keep the baby! My guys were gone Friday night to fall league baseball practice, so I had her all to myself for a few hours. She showed me her new tricks. 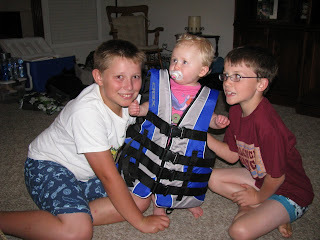 Once the boys were home, they goofed around with her for a bit and even tried Blake's new life jacket on her. It was pretty funny. Blake left early Saturday morning for his camping/canoe trip. That left me and Kevin to entertain Miss Reese. She enjoyed her breakfast of toast and jelly. She's a mess! My sister had left the leftover mini cupcakes from the birthday with us. It was appropriate to have them on Saturday since Reese turned 11 months on the 21st. Kevin and I sang to her. After all the sweets, it was time to brush her teeth. She LOVES brushing her teeth! We had a lot of fun. I was sad to see her go on Saturday afternoon. She is such a QT! Love those big blue eyes! Sounds as if your family is staying busy, take care Amy! SO cute!! I cannot believe she is already almost one. I see some fun girly pages coming . . .
She is adorable and I THINK that she looks a lot like her Auntie!